Mr Hollingsworth said: “We have always been, and continue to be, a forward thinking company who are keen to invest in and improve what we do. Having high standards in every area is what has helped us develop the business over the last 30 years and has brought us to where we are now. We have an incredibly loyal and longstanding team, with many of them having been with us for many years, and it has always been vitally important to us that we take their health and safety very seriously. “It’s the same for the high-profile clients we work for. They need to be able to trust that if they bring us on site for a job, be it big or small, that we are aware of our legal responsibilities and we have systems in place to prove that we treat health and safety with the upmost priority. The relevant paperwork which lists the up-to-date qualifications of our employees and the relevant certification for any machinery they are using is always with employees when they are doing jobs for our clients, whether this is in an on-site office or in a van, if the job is smaller. “But I was driving in to work one day, thinking about if there was a way this information could be stored virtually, on our smart phones. We all carry our phones around with us, almost all of the time. I thought it might be a way to back up the actual paperwork and potentially prevent staff having to stop what they were doing and go back to a site office to find it in the event of an on- the-spot inspection, which can happen at any time, whether it is on site for one of our clients or on our own premises. Rob Saunders, Daydream Designs Director and Co-Founder, said: “It’s been a great project to work on and we are all pleased with the results. What’s great, is that we are continuing to develop the content on there too. 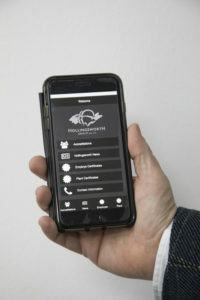 It is free to download for anyone and from there any user of the app can access up-to-date news and information about Hollingsworth Group. However, the much more sensitive information regarding staff’s health and safety qualifications and other documentation is all password protected.